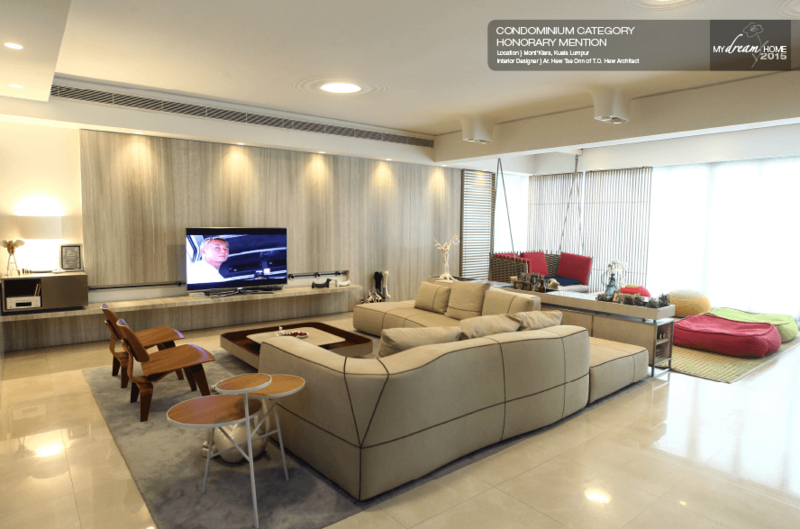 DESIGNING and decorating an apartment for a fairly big family can be a rather daunting task, particularly if you need to cater for the differing personalities within. Four bedrooms to fit three daughters and one son, each one ranging from quiet and retreating to outgoing and whimsical, as well as commuting parents, it almost feels like a complicated mathematical problem … or maybe not. The Chai family certainly do have a unique living arrangement. The father, who’s in the timber business, is based in Sabah for the most part, with frequent visits to the timber campsites in Terengganu, and at least two nights a week in Kuala Lumpur. The mother comes in for long stays once in a while to check in with the children before spending time back in her hometown or simply travelling. And while the parents are divorced, they are still very much a united family unit and 10 Mont’Kiara is home base, where the festive seasons are celebrated and where reunion feasts are held. Holding the fort at the family’s luxurious condominium is daughter Melanie, the eldest of the siblings. Thank goodness for the property’s spacious single-storey 4,000 sq ft units, and the ingenuity of the designer commissioned to turn it into a real home for each and every Chai. Architect Hew Tze Onn has worked with the family patriarch on several projects in Tawau, Sabah, including the family’s previous home there, which is described as having a “resort feel”. 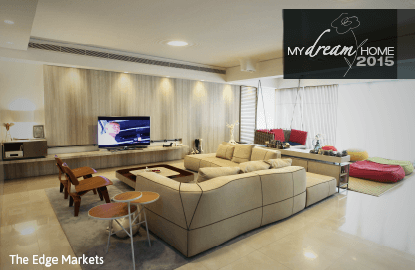 Melanie was tasked with taking the lead in outfitting their home in Mont’Kiara when they moved to Kuala Lumpur from Tawau four years ago, and worked closely with Hew on designing the layout and decorating the various spaces. The end result is visually engaging right from the entryway as Hew has incorporated the use of timber into the mix. Exit the private lift to the family’s unit, and you will experience within the first few steps an interesting contrast of warm and cool vibes. 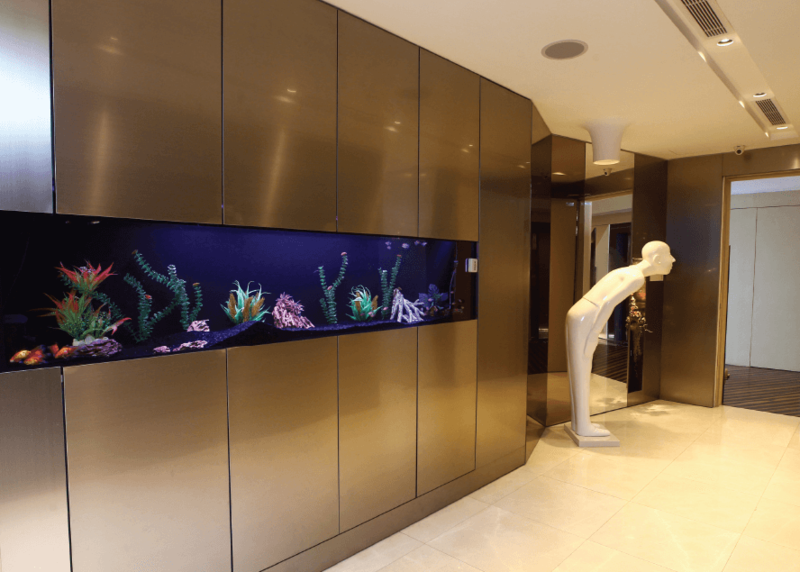 Walk through the main door and you are greeted by a tall white sculpture of a smiling man and a large aquarium of colourful tropical fish in a cool, futuristic stainless steel passageway. This is what Hew describes as the “transitional area” — to the left leads you to the warm, open-plan living and dining, while to the right takes you to the bedrooms. 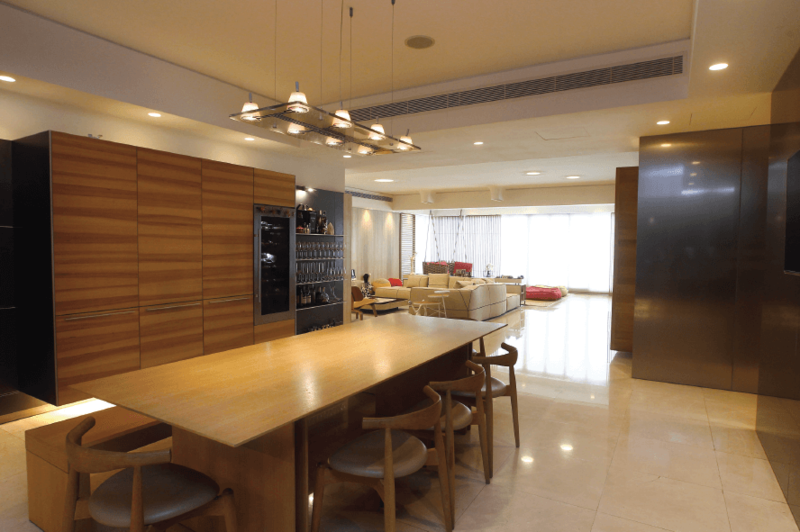 The living and dining area takes up a very generous space. It opens with the dry kitchen — also in stainless steel designed by Xtra for Bulthaup — and a large wooden banquet table with a mix of seating of one large bench and chairs. Beyond it is the extraordinary “public space”, which has three subtly demarcated areas, even though in essence it is one big space. The first square is formed by a large off-white settee and loose wooden chairs. When not entertaining, this is where the family gathers to watch TV. Further on is the second square, with a more informal and playful setting complete with a Paola Lenti Wabi swing and grass-like carpet. 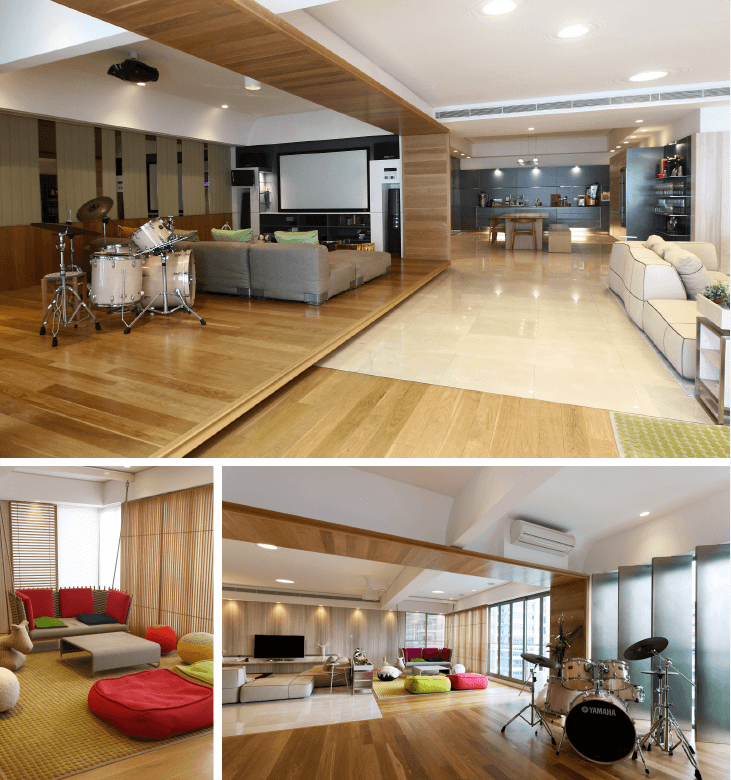 Beside that is the third area — the “Timber Box” that contains the entertainment zone (read: karaoke set-up with projector screen and funky sofas) and because of its raised level, doubles as a stage for the youngest son, an avid musician who sometimes thrills family and guests with his talent on the guitar, drums and piano. The floor-to-ceiling windows offer a great scenic view as far as the Pahang mountain range on a clear day, but because they face west, the stream of sunlight can be harsh at times. Hew installed sliding timber screens and stainless steel pivot panels that the family can adjust when needed to reduce the glare of the afternoon sun. Hew reveals that the original plan had a lanai where the “playground” is but he decided it was better to enclose and unify the space this way so it becomes one big, airy room. He also reveals the large stainless steel door that can be used to close off the public area from the bedrooms during loud parties, so those who want to retire early still enjoy some quiet and privacy. The corridor of the private area offers a slightly futuristic feel, due mainly to the use of stainless steel throughout. The coldness of the material is softened with laser cut-outs of flowers on the sliding doors — when the bedroom doors are closed and the lights are on inside, these laser cut-outs light up and lend an interesting aesthetic to this space. In certain corners are hidden LED strip lights to highlight the path and hint at where the doors of the bedroom are — at one glance, it just seems like an endless corridor of light and metal. Each “secret” doorway takes you to a bedroom, each one stamped with the personality of its inhabitant. One bedroom introduces us to the very whimsical, girly sister, whose room features a lot of floral motifs and vibrant colour. Another sees a shy, quieter, yet still feminine personality who loves her blocks of grey and purple walls and trimmings and interesting shelving solutions so her belongings are properly organised. Another sees a more practical sister optimising her smaller space by using an open wardrobe concept for her clothes and accessories. The final bedroom is the master suite designed for the parents to be shared with the son. It currently looks like it has been completely taken over by him as his collection of action figures and music paraphernalia dominate the shelves. Walking down the stainless steel passageway feels like you’re in a travelling machine that takes you to different worlds when you open the “secret” doors, and this concept really reflects the youth and vibrancy of siblings, to whom this home really belongs.